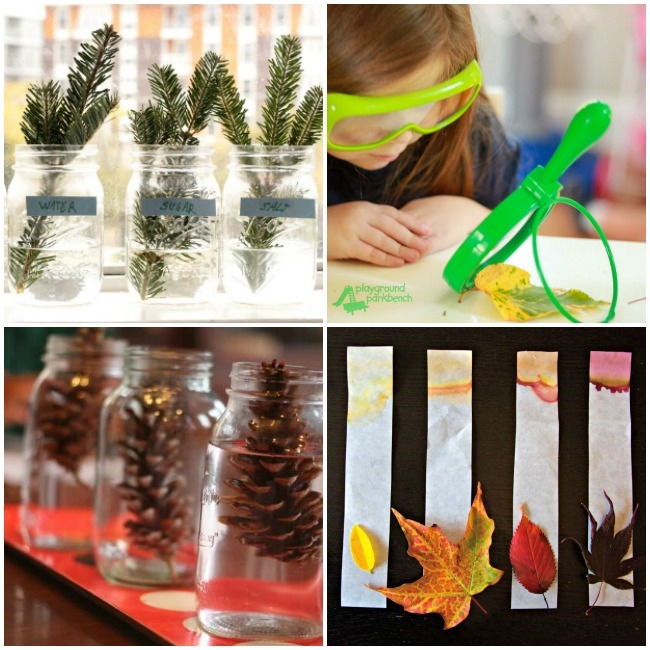 Fall science activities are some of the best because they are simple to put together and loads of fun for children! I love that nature provides the perfect materials for these: leaves, acorns, pumpkins, apples, and more! 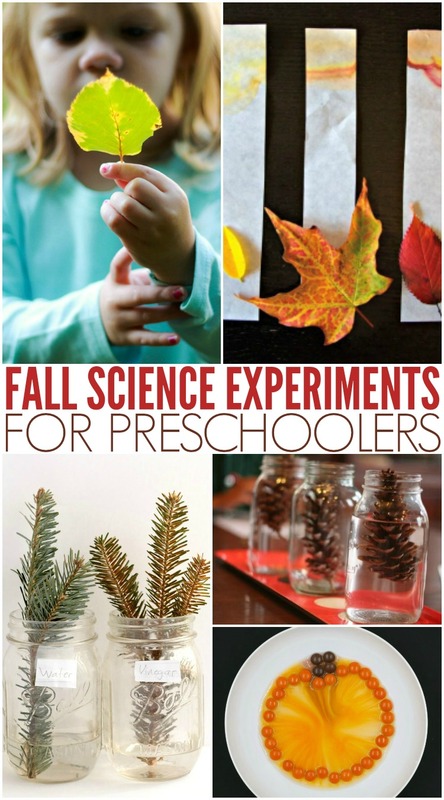 These fall science experiments and activities are perfect for fall science lesson plans, leaf experiments for preschoolers, and nature studies. If you ever need ideas for setting up a classroom science area for fall, here are some of my favorite fall science ideas to include. See which pinecones open the most with this quick and easy water experiment. Use seeds in a number of ways with these ideas! Put pincecones up to the window and see what they tell you! How Hardy Are Pine Branches? Find out how pine branches can thrive in different liquids! How Do Liquids Affect Apples? Find out which liquids turn apples brown and which keep them looking nice! Use acorns for simple acorn science activities and science experiments! This is a super simple science activity that teaches children about sinking and floating! Find out why leaves change color with a chromatography lab! This leaf chromatography experiment is probably my favorite! Teach kids about the colors in leaves with this leaf experiment! These cute ghosts are perfect to make and smash! This science experiment is too fun not to try! How do pumpkins grow? This is a great hands-on demonstration! This STEAM activity is fun as a pumpkin activity. Don’t get rid of pumpkins right after you use them. This is how to extend the activity. Make pumpkins out of candy! This is so cool! Use common ingredients from the kitchen, and if someone decides to taste it, there will be nothing to worry about…except the horrible taste! This volcano is one of the best, and the Jack-o-lantern one is my favorite! Make slime with a real pumpkin. This is definitely going on our to-do list! These are fantastic ways to learn about a pumpkin! See firsthand what happens to pumpkins over time. A bubbling pumpkin! Yes, please! This is such a great list for Fall! Thanks for including our Leaf Chromatography – my kids want to do it every year, they love it so much.